If you want to mimic the success of restaurant chains like McDonald’s and KFC, every restaurateur needs to take every step that will protect your dining establishment’s trade secrets. One common way to do this is by making sure that your employees sign a non-disclosure agreement. There are many ways to incorporate a non-disclosure agreement into your restaurant employment contracts. And there are various benefits for putting them into your contacts too. All of these will be discussed in the next few paragraphs. In this article, we have included examples of non-disclosure agreement template that any restaurant owner or business manager may use for their own businesses. 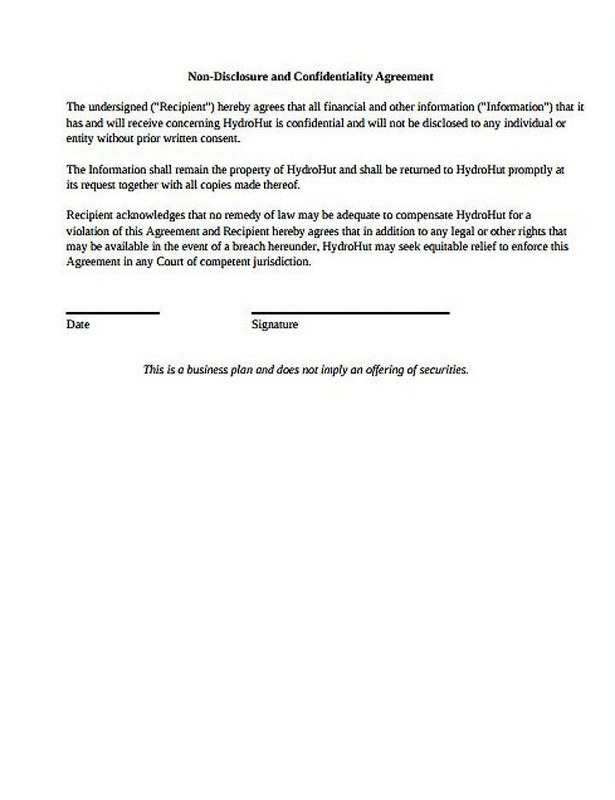 All these templates are available as PDF templates so make sure that you have a compatible computer software program installed before disclosing your desired agreement template. A non-disclosure agreement is an arrangement between two parties to not reveal any piece of information about the other person or party. This agreement is usually incorporated in most job contracts and is formalized in a written business agreement document. The two parties need to sign the agreement and the document needs to be notarized by a legal representative before it can be considered valid. Non-disclosure agreements are also called secrecy agreements, confidentiality agreements, and proprietary information agreements. Sample non-disclosure agreements or contracts are usually created to protect the legal business interests of one party. For instance, in the restaurant industry, some restaurateurs may require any prospective employee to sign a non-disclosure agreement in order to protect a trademarked recipe or technical know-how that the employee may gain by working at the said restaurant. There can be different types of business trade secrets that can be protected by a single non-disclosure agreement depending on the type of company or business entity that enforces them. In this article, we will specifically provide tips on how to create and fill out restaurant non-disclosure agreements. 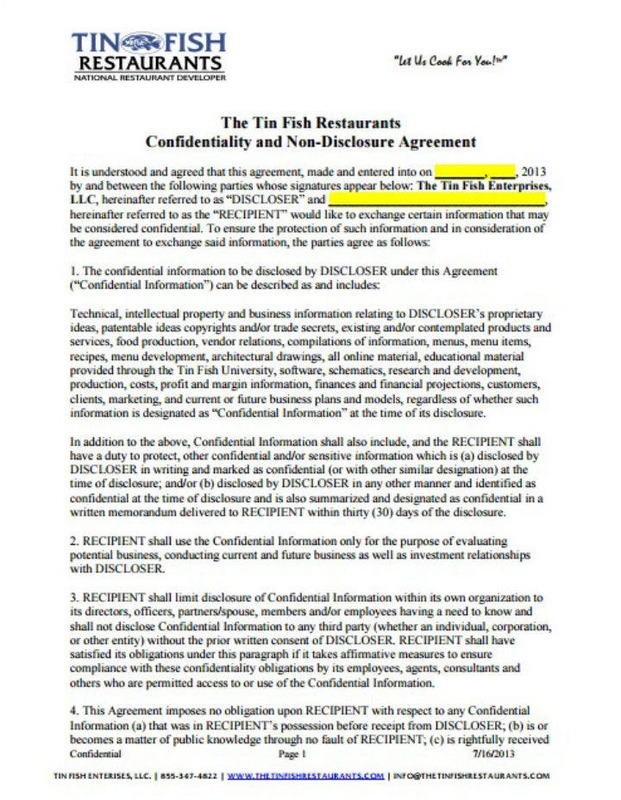 Multiple examples of free and downloadable restaurant non-disclosure agreement templates are also embedded all throughout this article for anyone to use. For most business managers and owners, creating a non-disclosure agreement clause in their employment contracts is an essential step if they want more proprietary protection for their restaurant business. But most often, this task is taken for granted since it can be such a hassle to create any formal written agreement. 1. Figure out what specific business policies, trade secrets, or company know-how or skills you want to be part of the non-disclosure agreement. The first step in creating a non-disclosure agreement for your restaurant is to decide on what specific business trade secrets or policies you want to be covered by your company’s non-disclosure or simple non-compete agreement. For example, this may include the original recipe for a gravy or cooking chicken that was passed down in your family. Or this may be a proprietary way of roasting meat. It may also be as simple as the specific marketing campaign style that your restaurant uses to gain customers. As the business owner, it will be in your hands on how restrictive or how free our employee non-disclosure agreement can be. That is why you should carefully think about the inclusions in your non-disclosure clause even before you actually create the written agreement. You may also see free non-disclosure agreement forms. 2. Determine the timeframe you want the non-disclosure agreement to take effect. In addition to the previous step, make sure that you also set a timeframe for the non-disclosure agreement to take effect. A good basic agreement will make sure that there is no loophole regarding the effectivity of the agreement. So, you (as the restaurant owner) or your lawyer should make sure that an employee cannot freely divulge all the company trade secrets even after they have ceased working at your restaurant and you have to make this clear on the agreement. If not, other people may take advantage of this legal loophole and cause irreparable damage to your business and brand. 3. Follow the specific legal wording for a non-disclosure agreement from an agreement template. Or consult with your lawyer. 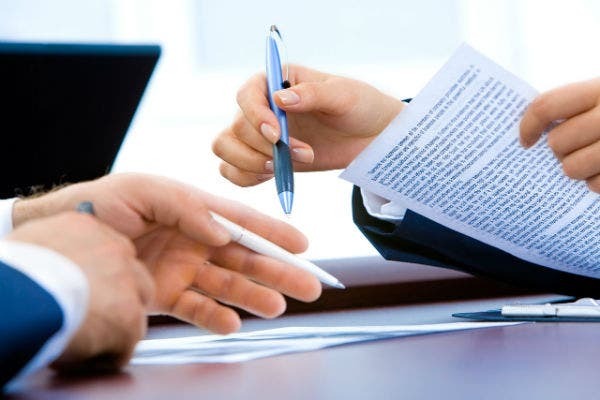 For most people, drafting a legal agreement or contract can be difficult. That is why if you are not comfortable with writing your own contract, you may follow the wording or verbiage from an existing non-disclosure agreement template. You may easily find this online nowadays. Also, for a more accurate legal advice, it is best to consult your lawyer. He or she can even draft the entire non-disclosure agreement for your restaurant contracts. But remember, their professional advice will cost you something so make sure to prepare the necessary amount of money to pay for your lawyer’s time too. 4. 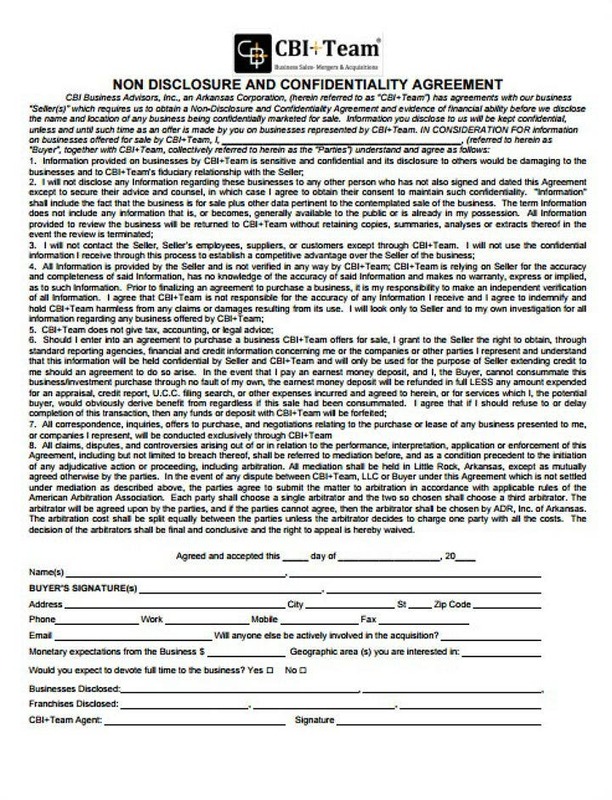 Download said non-disclosure agreement template. So if you have decided to create the first draft of a restaurant non-disclosure agreement by yourself, the next step you should do is downloading any printable non-disclosure agreement template online. You may then use this template file as a pattern or base for your own non-disclosure agreement form. Remember that you should also choose a template file that is available in a software format that you know how to use. More information about this will be discussed in the next few steps. You may also see non-disclosure agreements. 5. Open template or create a new template using your preferred graphic design or desktop publishing software program tool. After downloading a non-disclosure agreement template, you can now begin editing the printable template on your own. To do this, open the template file in a compatible graphic design software tool. For example, if the template is available as an InDesign template, you will need to have Adobe InDesign installed on your computer and edit the template using that software program. In this article, most of the templates included are PDF templates so you will need to have at least Adobe Acrobat Reader installed on your computer before you can open and edit it correctly. You may also see non-disclosure and confidentiality agreement templates. Listed below is the continuation of the steps on how to create and draft a non-disclosure agreement for any restaurant or dining establishment. You may also see standard non disclosure agreement forms. 6. Format the non-disclosure agreement template according to your preferences. Once you have opened the non-disclosure agreement template on a compatible graphic design software tool, it is not time to choose a specific format that you want your agreement to follow. Most agreement templates will follow a standard narrative in paragraph format. But other times, you may also create a non-disclosure agreement that will feature a bullet list of all the things you can and cannot do as part of the agreement. As the restaurant owner, it will be in your hands on how to format your non-disclosure agreement templates. Choose the agreement format that you think will best facilitate understanding of the contract among your employees. You may also see word non-disclosure agreement templates. 7. Do not forget to add your restaurant’s branding designs. 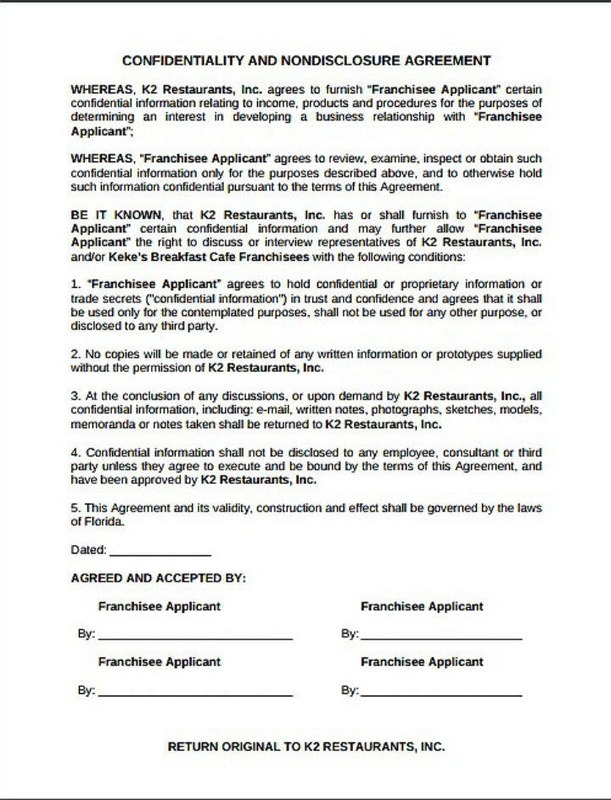 Also, while you are formatting your non-disclosure agreement, do not forget to add your restaurant’s unique branding identity designs on the agreement template. Doing this will help make the agreement appear more formal and credible. 8. Ask someone else to edit and proofread the template. When you are done typing all the agreement verbiage and have also finished formatting the entire agreement, it is time to ask someone else to edit and proofread the entire agreement. You may ask someone else to look for any typographical errors while you may consult with a lawyer to validate if the terms of the agreement are acceptable and can be honored in court. You may also see sample non-disclosure non-compete agreements. 9. Make necessary corrections and print out the template. After that, make the much-needed corrections on the agreement. And, finally, you can start printing out the non-disclosure agreement template. Print it out on high-quality paper for maximum effect when your employees get to sign it. You may also see non-disclosure and confidentiality agreements. Also, do not forget to pat yourself on the back and congratulate yourself for a job well done. 10. 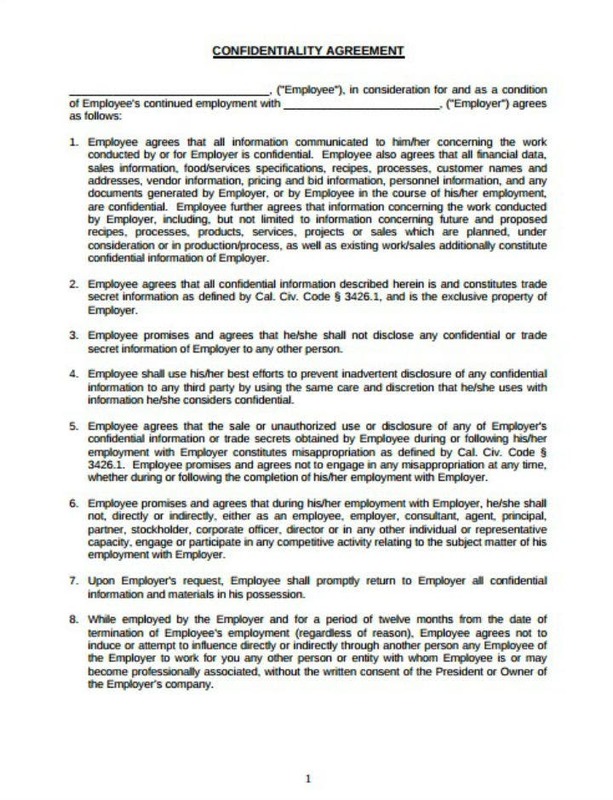 Begin distribution of the non-disclosure agreement form to your employees. Lastly, it is now time to begin distributing the restaurant non-disclosure agreements to all your human resource offices in all your restaurant branches. 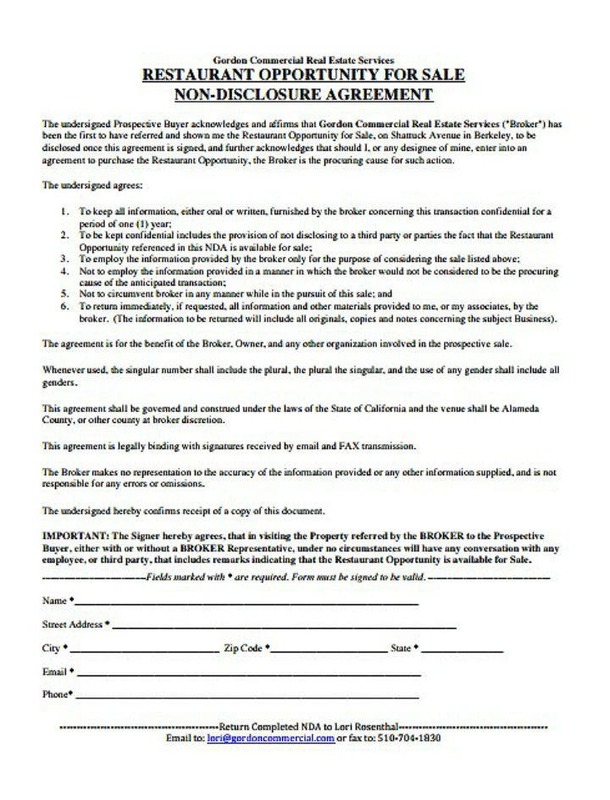 This way your current and new employees will get to sign this agreement right away. Huzzah! Now that you know what restaurant non-disclosure agreements are and how to create them, you should start drafting your own agreement template for your own dining establishment. Do not take this step for granted as you may only regret it later on when you find out that a former employee has already gone off to start his or her business using the skills he or she has learned from your restaurant. Create a simple restaurant non-disclosure and non-compete agreement today and be prepared for the future of your dining establishment. You may also see confidentiality disclosure agreements. Also, if you wish to share this valuable piece of knowledge with your other restaurateur friends, link them to this post on social media or send this article to your email list.